The Tap Room offers food from noon until 9:30pm and no booking is required. Afternoon tea is available daily between 3pm and 5pm and requires booking in advance. Experienced, passionate about cooking and eager to challenge convention, our Executive Chef Rory Whelan and his team are making their mark. 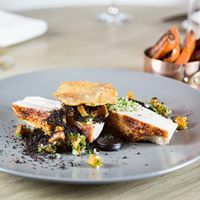 With our two restaurants at The Swan, we offer variety, choice and outstanding food and drink. Our Tap Room is a showcases Adnams’ beers. Quality ingredients and unique flavours are true hallmarks of both our beers and our food menu. Our Tap Room and bar is open from noon to 10pm, serving a full menu all day, every day, no booking is required. 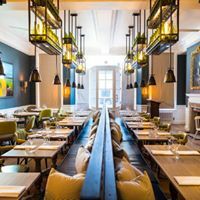 The Still Room is elegant yet relaxed and informal and the food is delicious and challenges convention. It’s a lovely environment in which to enjoy exceptional food, award-winning Adnams drinks and great service. The Still Room is open from noon until 3pm, and 6pm – 10pm. Why not treat yourself with a sumptuous afternoon tea in our drawing room overlooking the market place? Relax into our comfy chairs and sofas and enjoy three tiers of delights: a selection of sandwiches on assorted breads, buttermilk scones with clotted cream and jam and a tempting variety of pastries and cakes. 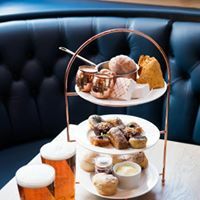 Make your Afternoon Tea with us extra special by adding a glass of Adnams Champagne or an Adnams Copper House Gin and tonic. Another wonderful evening with friends in beautiful surroundings with excellent service and great food. Everyone had a lovely evening, thank you. Thank you, Serena, for sharing with us, your feedback of your recent visit to The Swan. It is wonderful to heat that you all had a lovely evening and we very much look forward to welcoming you back in the future. Problem with menu for Christmas afternoon tea wonderfully put right by Ellise. Ian, thank you for your feedback; we very much appreciated it. We are terribly sorry to hear that you experienced a problem with the afternoon tea menu, however, we are delighted that Elise was on hand to rectify the situation. We very much look forward to welcoming you back in the near future. Overall a very good experience and the food was excellent. The only disappointment was that I had to send 2 pints of "Old Ale" back as it was undrinkable. Although it was replaced by 2 pints of Ghost Ship and an apology that the beer was off, it was not what I had expected from an Adnam's Hotel in Southwold. Otherwise 4 stars would apply. Thank you so much for taking the time to share with us, your review of your recent visit to The Swan; we very much appreciated your feedback. We are delighted that overall you enjoyed your experience with us and can only apologise that the beer that you were served was not at its best. We very much hope to welcome you back to The Swan in the future. Fabulous hotel and great staff. You made our Wedding Anniversary very special so thank you. Thank you for the Happy Anniversary cakes in our room which was a lovely surprise. We will be back. Just one small niggle! It would be nice to have a chocolate or two with coffee after dinner! Overall our experience was excellent. The only observation I would make that service in the lounge was very slow but the staff were extremely apologetic. I am guessing this was just a minor blip as the food and service in the restaurant was superb. Will definitely re visit. Thank you for taking the time to review The Swan. We are delighted to hear that your experience with us was excellent. I do apologize that the service in The Lounge. I shall pass your comments to the General Manager to have a look into. Great, engaging service a good standards throughout. Wonderful atmosphere and base it remains a regular place to visit. Thank you Craig and team! We are delighted that you had great engaging service and good standards throughout. We shall pass your lovely comments back onto Craig and the team. Thank you Deborah, for taking the time to share your feedback with us; we are delighted that you found the team to be friendly and helpful and we very much look forward to welcoming you back in the near future. Had a delicious meal here, beautifully served. Loved the decor. Great for our birthday celebration. Highly recommended. Rosemary, thank you so much for sharing with us, your feedback of your recent visit to The Swan; we very much appreciate it. We are delighted that you chose The Swan for your birthday celebration and that we did not disappoint. We very much look forward to welcoming you back in the not too distant future. Your reception staff are fantastic, and Craig your Head waiter/Sommelier was superb in his attention to our needs. We are delighted to hear you found our team fantastic Our team will be pleased to hear you found their service to be by head waiter superb with his attention to your needs. All very good. Only disappointment was the difficulty in getting served in the Tap Room. All the staff were very charming in the hotel. And the dinner in the main restaurant was very good in every way. This was our first visit to the Swan and It will certainly not be our last. It was a pleasure from start to finish. All the staff were lovely and friendly. The meal in the restaurant was excellent. Top marks all round. We are delighted to hear you had a delicious meal and the staff were attentive. We had a very special evening at the Swan this week, to celebrate our anniversary. The food was exceptional and the service really complemented the experience. Thank you and we hope to visit again. We are delighted our food and service were able to compliment your experience. It is lovely to hear you had a faultless dining experience. Been wanting to eat here since the refurbishment and wasn’t disappointed. The negroni and steak were the highlights! We are delighted to hear you were able to dine with us and that you were not disappointed. Very disappointed with the afternoon tea,  we took our friends as I thought it would be a nice one, but no..the 4 of us were squashed round to tiny tables in window, no room to put everything, sandwich’s were not very nice, scones too many plain, cakes were ok, but way overpriced for what we had!!! Sadly our main course was spoiled by kale that was so salty it was inedible. Otherwise the meal was interesting and very good. We are disapointed you found the Kale on  your main course too salty and inedible i will pass these comments onto our chef, but pleased you found the meal otherwise interesting and very good. We are delighted to hear that you enjoyed your meal. We so pleased that the food was gorgeous. A lovely meal to celebrate a family birthday. We are delighted to hear that you had a lovely meal to celebrate a family birthday. We hope they had a wonderful birthday. Thank you so much for making my stay so wonderful. The finishing touches of adding a welcoming piece of cake for my partners birthday was very special (and something we didn't ask for!). The food was exceptional and we can't wait to plan a return trip. Whilst we stayed at the swan we also visited the gin distillery and our tour guide was very knowledgable and managed to make our tour a very enjoyable experience. We are delighted to hear you found the food to be exceptional. A disappointing experience, the food was of poor quality and when mentioned to the waitress, the manager was very disinterested. Yorkshire pudding and veg in the roast were both cold and the roast potatoes were pale and wan, certainly not golden and crispy. We don't see the point of booking the Still Room as the bar food appeared to take priority. Better places to eat in Southwold - Sutherland House last week was far superior. Thank you Mrs Stafford for your review, we appreciate your feedback. 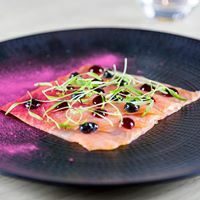 We are saddened to hear you found our food was not up to our usual high standard on this occasion; our aim is to provide a high level of guest experience and we can only apologise that we fell short of your expectations. We do hope to be able to welcome you back to The Swan in the future, for you to experience our usual high standard, that we are all so very proud of. Fabulous decor and fabulous food..
busy and buzzy, brilliant young staff. We are delighted to hear that you all enjoyed your dining experience with us. We are so glad to hear such wonderful comments about the decor, food and staff.